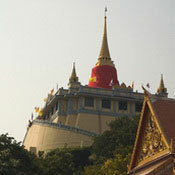 The Golden Mount or 'Phu Khao Thong' is part of the Wat Saket temple located just outside the old royal city precincts, next to the Pom Mahakhan fort. 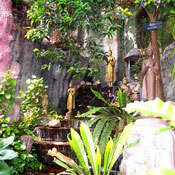 There are about 300 steps in all & it's not a strenuous climb, as the slope is quite gentle and there are numerous spots to stop and see something. 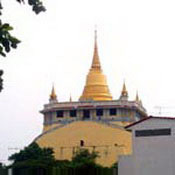 The Golden Mount has a somewhat unusual history in that it was expanded by King Rama III, who wanted to build a large chedi on the site to mark the entrance to the city. However, the soft marshy ground could not support such a large structure and it collapsed before it was completed. 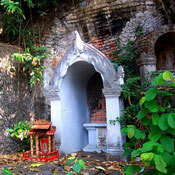 During the late-18th century the temple served as the capital's crematorium. During the following 100 years, the temple became the dumping ground for some 60,000 plague victims who were not allowed to be buried within the royal city precincts. From the ground, a wide stairway spirals up and around the sides of the mount and the short steps ensure you don't expend too much energy. The best time to visit the temple is during the cool season from late November to January, when not only is the temperature much cooler, but the frangipani trees around the base are in bloom, giving off their wonderful jasmine-like smell. In the first week of November, Wat Saket hosts an annual temple fair with lots of lanterns.